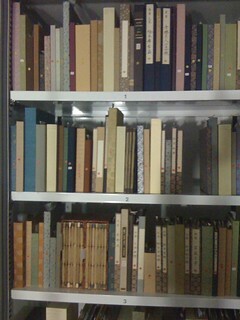 Right: Just a few of the roughly 2,000 books in the Freer’s Pulverer Collection. As I’ve mentioned in previous posts, this is a collection of roughly 2,000 Japanese books, almost all of them woodblock-printed, and almost all of them from the Edo period (1600-1868); I’m not sure how many pieces are included in the exhibition, but I am sure that the museum has done a good job of choosing interesting, attractive, or otherwise historically important works to show. I’m sad that I won’t get a chance to see the exhibition myself, as I don’t expect I’ll be going to the East Coast this summer. But, for anyone who is able to go, the show is up from April 6th through August 11th. Perhaps not the most colorful works, but very important ones. 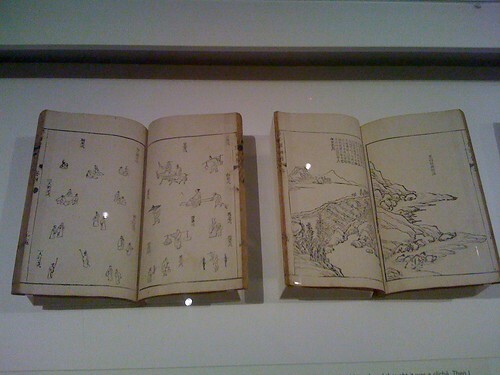 Two Japanese copies of the Chinese Mustard Seed Garden Manual of Painting, on display at the Museum of Fine Arts, Boston back in 2010, standing in here on this blog post for the current Sackler exhibition of which I have no photos since I am unable to go there to see it for myself. Hopefully, it won’t be long before the online catalog database of all the works – all the thousands of photos my compatriots and I took – is up and ready for public access. In the meantime, however, the Freer-Sackler has put together a beautiful page for Hokusai’s Ehon sumidagawa ryôgan ichiran (“Illustrated Book Listing Both Banks of the Sumida River”). Click through, and you can see each opening (i.e. each page) of the illustrations, lined up next to one another, revealing a single continuous panorama image of the Sumida River which ran through the shogunal capital of Edo (today, Tokyo). Imagine holding this book in your hands and paging through it, seeing the image continue on the next page, and the next page, and the next page. What Hokusai does here is innovative, and, I think, quite charming, fun, and kind of brilliant. The Pulverer Collection catalog, if it ever goes up, will contain literally thousands of other books, each intriguing, charming, compelling or innovative in its own way. Once that goes up, and assuming I can find the time, I’ll finally be able to start sharing with you some of my favorites. 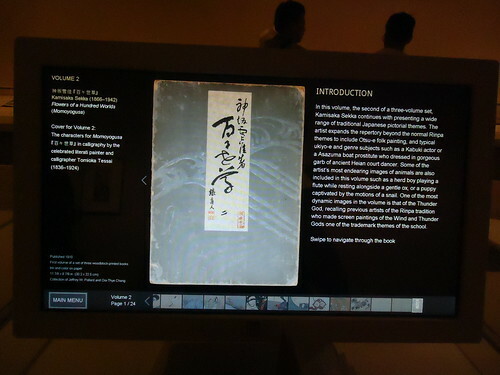 An image from a display at the Metropolitan Museum, featuring one of the books also included in the Pulverer Collection. Once the online database goes up, it might look something like this.